The Rootes family had been building Hillmans and Humbers since 1935. William (knighted in 1959) Rootes led the company with his younger brother Reginald. William's sons, Brian and Geoffrey, were in charge of sales and marketing. Lord Rootes was a man who believed in rugged, reliable transportation and his cars were constructed that way - no individuality, but solid. At some point in time, however, the Rootes Group took over the ailing Sunbeam and Talbot marques. Brian and Geoffrey would be the impetus which carried at least one of these names into the 1960's. The Sunbeam name was used for high-quality, comfortable open-touring cars well into the 1950's (an Alpine was the car used by Cary Grant in 'To Catch a Thief"). Thanks to the nagging efforts of Brian and Geoffrey, it was decided that the new sports-car craze should be capitalized upon. The plan was to unveil a newly designed Alpine at the 1959 Motor Show and chief designer Kenneth Howe was given the task of doing so. As the story goes, Howe had fallen in love with the 1955 T-Bird while on a trip to the US and he utilized many of its design elements in the Alpine. 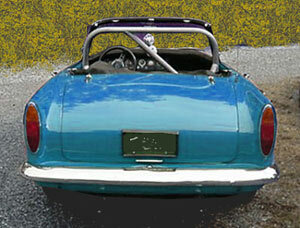 The story has never been fully verified, but if you look at the Alpine it is very much a miniature '55 Bird. The man in charge of mechanical/ chassis layout was Norman Garrad. He based the new Alpine on the Hillman Husky and used the drivetrain out of the Rapier, only changing the cylinder head and adding twin Zenith carburetors, netting 78 horsepower. The resulting Alpine was rated by automotive writers the world over as a new generation of sports car which offered not only weatherproof driving but greater comfort than many small sedans. Ian Garrad had paid a lot of attention to the doings of a certain Texan who had retired from formula racing with a heart condition. Nowadays (early '60s), this Texan was stuffing Ford V8's into AC Bristol cars and making somewhat of a legend of himself in the process. Ian asked Carroll Shelby if he might be willing to try the same formula on one of his Alpines and Shelby said OK, for $10,000. The Alpine was such a sturdy little car that the V8 conversion only required a few modifications. The radiator was enlarged, an MG steering rack replaced the ball-sector unit, new motor/transmission mounts were fitted (from a Fairlane) and a modified driveshaft was made up. The engine only had 3/8-inch clearance to the wheel wells and firewall, the bay was so tight. This caused cooling problems, so the final drive was modified to 2.88:1 to keep revs down at lower speeds. The prototype car was tested on all kinds of roads in all conditions and everyone was pleased with the effort. Now the hard part — convincing Lord Rootes to build it. One drive in the V8 Alpine and Lord Rootes fell in love with it, naming the car "Tiger". The decision was made immediately to produce the car and sales started within months. Soon the magazine ads were touting the "world's fastest sports car priced under $3600". The motoring press was generally impressed with the Tiger and people started buying them. Sales never went through the roof. You see, Chrysler had bought Rootes Group in 1963 and the Tiger was sold through their dealership network. What we had here was a British car powered by a Ford engine sold at a Chrysler showroom. Customers worried about who would honor the warranty if the engine seized, etc. Besides, even at $3600 the Tiger wasn't cheap. A new Corvette could be had for that price and an XKE was just $1500 more. The Tiger was just in the wrong place at the right time. Chrysler loved the Sunbeam and their engineers considered installing a small V8 of their own but the rear-mounted distributor foiled any serious efforts. Only Ford used a front distributor. For 1967, the Tiger featured the new 289 V8 from Ford and at 200 horsepower the Tiger was just that — a high performance sports car. By that time, however, only 7060 Tigers had been built and the end was in sight. It all ended in November of 1967 when the last of the 151 1968 models was produced. 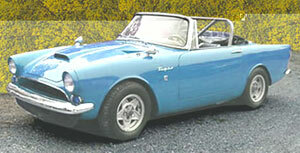 The Sunbeam Tiger is highly collectable and steadily increasing in value. This "poor man's Cobra" is a delight to drive and about as reliable as any sports car can be. The Tiger makes an excellent SCCA racer, too. Too bad that Chrysler took 25 years to recognize its need for an identity. If they had fitted it with one of their own V8's, called it the Viper, who knows how many would have been sold over the years?